Kyanite, also known as dysthene, is a mineral form of aluminum silicate (Al2SiO5). It occurs in schists and other metamorphic rocks, generally as elongated, blue-bladed crystals (triclinic) or aggregates, although it also may be white, green, or gray. Color may vary within a single crystal, which is usually transparent with a vitreous luster. 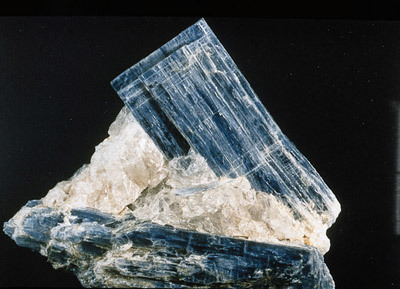 Kyanite is used in making high-grade porcelain for electrical insulators; good clear crystals are used as gemstones. Hardness: 4–5 along the crystal, 6–7 across; relative density 3.5–3.7.